Hi! 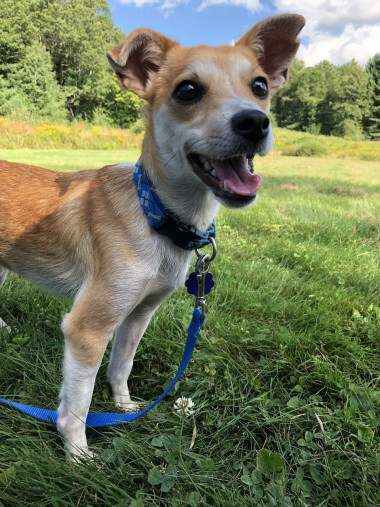 My name’s Bailey and I’m a 2-year-old neutered male Chihuahua Mix. I came to Lucy Mackenzie with a bunch of my buddies from Mississippi earlier this summer. I was adopted soon after arriving, but things didn’t work out as well as we had hoped. The good news is that we all learned a lot about what I need in my new home. My continued obedience training is going to be very important. Some people think that smaller dogs can get away with things just because we’re small, but that’s not true. Boundaries and rules are really helpful and will go a long way towards my happiness. We also learned that young children confuse me quite a bit. I’ve met people of all ages here at the shelter, but in my home, it would be best if I lived with older, dog-savvy children only. I really like being around people, and will do pretty much anything to be near them. I’ve been known to climb up and over my kennel door here at the shelter, which is why I shouldn’t be trusted in a fenced in area left to my own devices. I will probably find a way out. The good news is that I love going for walks and playtime, especially with my favorite toy balls, so I promise you that we’ll always have a good time. If you’re looking for a new canine companion that will surely bring lots of love and joy to your life, stop in and meet me today! Complete this form to sign up for our emails and to receive a digital copy of our bi-annual newsletter. If you prefer to receive a hard copy of our bi-annual newsletter, please enter your name and address above.